The details and artwork for Doctor Who Magazine issue 482 have been released. Click on the cover for a bigger version and check out the details below. • Rachel Talalay, director of the 2014 series finale two-part finale, reveals the secrets of how Death in Heaven was brought to the screen. • Peter Purves, who starred as companion Steven Taylor in the 1960s, talks in-depth about his time on Doctor Who. • Discover fascinating new facts about the acclaimed Seventh Doctor story The Greatest Show in Galaxy in The Fact of Fiction. • Doctor Who showrunner Steven Moffat answer readers’ questions – including the knotty problem of the Doctor’s many wives! – in his exclusive column. • Writer David Fisher, who wrote three memorable stories for the Fourth Doctor in the 1970s, revisits his work. • The Doctor and Clara face Sontarans and Nazis as The Instruments of War continues, a brand-new comic strip written and illustrated by Mike Collins. • Sarah Jane and the Brigadier are reunited, as the Time Team watch The Sarah Jane Adventures: Enemy of the Bane. • Jaqueline Rayner wonders how the Doctor’s companions would get on in the Cubs in Relative Dimensions. 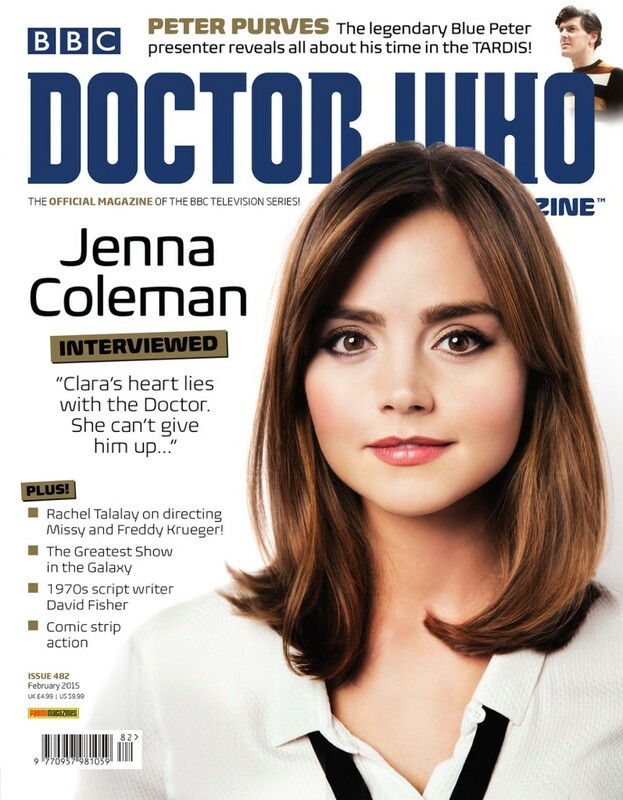 • Last Christmas is put under the spotlight in The DWM Review. • The Watcher considers the many surprising ways that Doctor Who stories can change from script to screen in Wotcha!. • The Watcher gives the answers to his Fiendishly Festive Christmas Quiz! How well did you do? • Have your say on Peter Capaldi’s first series as the Doctor in the DWM Season Survey. • The DWM Crossword, prize-winning competitions, and much more!